Babies spend hours rolling around and practicing tummy time on their play mat, which makes it all the more surprising that so many are made from vinyl or foam and a garden variety of toxins and chemicals. A new mother in Canada simply wanted a safe play mat for her little one, so she created it. The Kutchu play mat has impressive eco-friendly features: it’s non-toxic and made from biodegradable natural rubber, a renewable resource. The easy-to-clean surface only requires wiping (meaning you’ll have one less thing to add to that pile of laundry), and the play mat rolls up just like a yoga mat. With a large play area (approximately 4.25 x 5.5 ft), and a reversible design that boasts bright purple and vivid green colors, the Kutchu play mat is a non-slip, gently cushioned place for little ones to sit, crawl, and practice for their next big step into the world. Babies spend hours rolling around and practicing tummy time on their play mat, which makes it all the more surprising that so many are made from vinyl or foam and a garden variety of toxins and chemicals. A new mother in Canada simply wanted a safe play mat for her little one, so she created it.�The Kutchu play mat has impressive eco-friendly features: it's non-toxic and made from biodegradable natural rubber, a renewable resource. The easy-to-clean surface only requires wiping (meaning you'll have one less thing to add to that pile of�laundry), and the play mat rolls up just like a yoga mat. 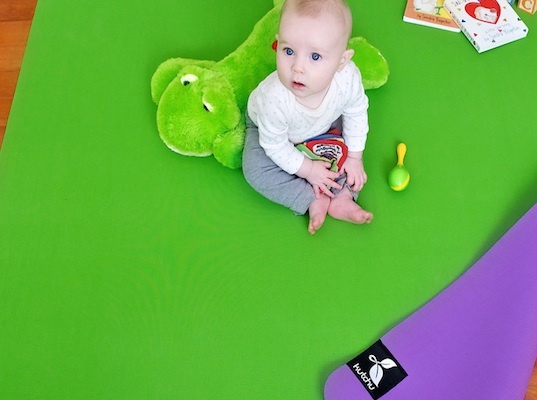 With a large play area (approximately 4.25 x 5.5 ft), and a reversible design that boasts bright purple and vivid green colors, the Kutchu play mat is a non-slip, gently cushioned place for little ones to sit, crawl, and practice for their next big step into the world.